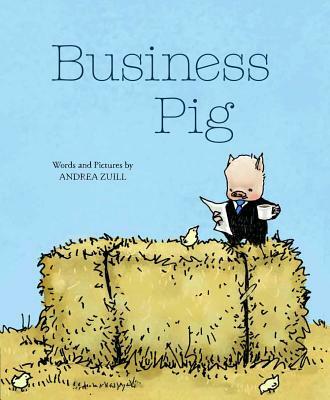 Move aside, LEAVE ME ALONE and MOTHER BRUCE: there's a new quirky picture book in the house, and its name is BUSINESS PIG. Jasper isn't like the other animals at the farm sanctuary. His skills as a business pig make him an odd duck among the goats and chickens, but Jasper won't let it get him down. Instead, he'll create the best marketing campaign ever: to prove that business pigs make great pets. With adorable illustrations—look at Jasper's facial expressions on literally any page!—and a heartfelt story, this is a must for bookstore shelves—and for the shelves of every customer that comes into the store. It makes a great read-aloud. It makes a great graduation gift. It is utterly delightful, and I look forward to forcing into the hands of everybody that comes into the store—adult or child. Jasper would rather draw graphs than play in the mud. Can this cutie pig find someone to adopt him who means business, too? Right from the start, everyone at the barnyard could tell Jasper wasn't like his siblings: "I believe what we have here is a gen-u-WINE Business Pig " No wallowing in the mud or rooting for grubs for Jasper; he'd rather help with the bookkeeping or conduct a meeting. Though everyone at the animal sanctuary loves him, Jasper longs for a forever home. But no matter how many business cards he hands out, no one wants to adopt him. Can this above-average pig find his special person to cut deals with? Andrea Zuill's art was exhibited in galleries in California, Texas, and New York, including the San Diego Museum of Art and the Brand Library gallery, where she won the Disney Imagineering Award. A member of the SCBWI, she won the 2010 SCBWI Mentorship Award. Andrea is the author of Wolf Camp (Schwartz & Wade), Dance Is for Everyone, and Marigold & Daisy (both Sterling). She lives in the San Diego area.